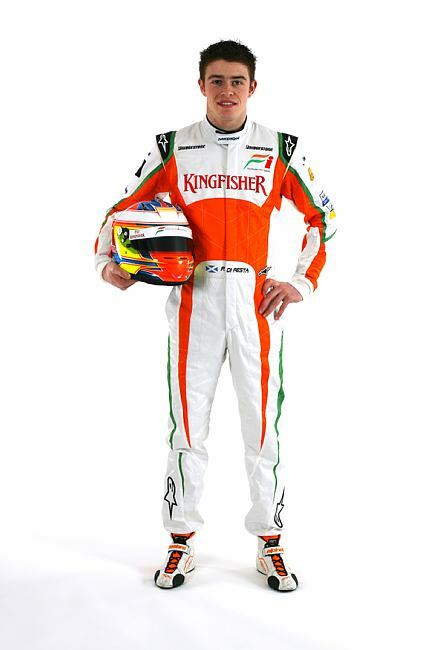 Paul di Resta is one of the hottest young British racing talents. Born in Scotland in 1986 to parents of Italian descent, he started karting at a very young age, following in the footsteps of his cousin Dario Franchitti, who recently secured his second IndyCar championship title. Karting success led to a switch to the single seater UK Formula Renault winter series in 2002 and to a drive in the full championship in 2003. Paul remained in the series for the 2004 season, with four wins leading to third position in championship. Success in this category brought him to the attention of an international audience and he won the highly coveted McLaren Autosport BRDC Young Driver of the Year award, which gave him his first chance to sit in an F1 car, treading the path previously laid by other established drivers, including his cousin Dario and fellow Scot David Coulthard. The award also paved the way to the prestigious F3 Euroseries in 2005, in which he finished 10th at his first attempt. The following year, however, Paul eased his way to the Euroseries laurels with five wins and a further four podiums, beating current F1 driver Sebastian Vettel. The win caught the eyes of Mercedes’ bosses and in 2007 Paul made the switch to tin top touring car racing and the DTM championship. In a two year-old car he finished on the podium four times and finished fifth overall in the final classification, a result that led to a works’ drive the following year. A strong run of five second places and one victory placed him second in 2008 – a remarkable result in only his second year of touring car racing. In 2009 Paul remained with Mercedes to secure a further victory and third overall in the championship. Through his association with McLaren, Paul has tested a McLaren F1 chassis twice, the last occasion coming in October 2008. His most recent F1 experience however came with Force India when he participated in a three-day young driver test in Jerez 2009. His potential was clear and Paul was signed as a test and reserve driver with a view to creating a long-term association with the team.